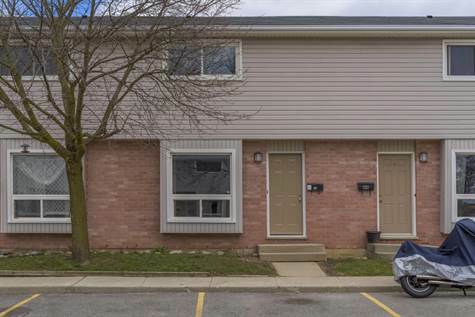 Don't miss this beautifully updated, 3 bedroom townhouse. New grey laminate flooring graces much of the unit. Walls have been freshly painted in neutral tones and it's all ready for you to move in! Perfect for a first time buyer or for an investor looking for a rental. The spacious living room/dining area has lots of natural light. The quaint and functional kitchen has a door leading to the back, fenced-in patio and beyond that, a small green space. The 2nd floor holds 3 good-sized bedrooms with ample closets and a 4 piece bathroom. On the lower level you will find a finished bonus room, lots of storage space and laundry hook-up. One designated parking spot #47 (max 2 vehicles on property per unit). Book your showing quickly because it won't last! !